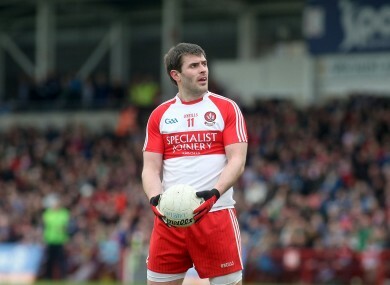 Derry captain Mark Lynch produced an influential display as his side beat Dublin. Cork’s unbeaten record ended in Castlebar yesterday and it took a stunning show of attacking strength to undo them. Mayo shipped the first five points of the game to Cork but recovered thereafter to take control with Jason Gibbons and Aidan O’Shea providing the platform for dominance at midfield. Their attack pitched in then as they bagged four goals and but for Ken O’Halloran’s saves, Michael Shields clearances and Mayo spurning chances, more green flags would have been raised. Mayo’s forward line has got flak in the past but they looked strong yesterday. Derry had plenty reason to feel aggrieved last Sunday against Cork when they gained nothing from their long trip south. A splendid second-half comeback fell just short as they fell to a one-point defeat. Yesterday they made amends with a victory of substance against Dublin. Brian McIver’s side continued their impressive form since making the jump up to Division 1 and owed a lot to captain Mark Lynch for their success. The Banagher club man shot 1-8 in a virtuoso performance that featured the game’s solitary goal and a few stunning points from play. Lynch showed his worth for Derry when nailing the leveling point against Tyrone on the opening night and he was of immense value to the Oak Leaf county again yesterday. Contrasting emotions for the respective squads after yesterday’s tie in Newbridge. Kerry lost out at St Conleth’s Park last year but showed signs of progress in winning yesterday. James O’Donoghue led the line again with Paul Geaney providing good assistance. They showed some consistency after last week’s thrashing of Tyrone. Their relegation fears may have abated but Kildare’s have heightened. The pressure has been heaped on them and Jason Ryan’s side badly need a response. After a week where Ciaran Kilkenny saw his season end due to cruciate damage, Dublin were boosted by the return of another attacker to form yesterday. Defeat may have been Jim Gavin’s side’s lot in Celtic Park but Alan Brogan’s sparkling play provided a bright spot. He shot 0-6 and offered a timely reminder of his capabilities after injuries have ruined his recent campaigns. It could hardly have been a better week for Roscommon and Cavan football. The county’s U21 teams both claimed fine victories midweek – Roscommon away to Mayo and Cavan away to Derry – before promotion to Division 2 was wrapped up yesterday. With two rounds to go, it’s a fine achievement for John Evans and Terry Hyland’s teams. They can look forward to a Croke Park league decider in April and it’s a good springboard for the summer ahead. Email “5 talking points after the weekend's football league action”. Feedback on “5 talking points after the weekend's football league action”.